We like to think that our politicians are above telling lies or untruths. Once they get into Parliament they are of course the law makers, and the public should therefore be able to expect that they will be law abiding, not fraudulent. Generally we see politicians who don’t have the answers to dodge the question and instead give an ‘interesting’ but very often an answer unrelated to the original question. There are even websites that show examples on methods used by politicians to avoid hard questions which I found quite amusing – I’m sure Winston know’s all the tricks! While I’m not sitting watching all the political debates, I do try to follow what is being said that relates to the housing and home loan markets as that directly impacts on what I do – my job. As a mortgage broker I like to be well informed so I can provide advice and opinion to ultimately help people. Of course with this being election year we hear a lot of “stuff” from various politicians trying to make out that their party policies are going to fix all the problems that other parties have caused. If it wasn’t such a serious matter then you could expect to search these political interviews under the comedy section, but unfortunately it is serious. It’s therefore very frustrating when I hear things being rolled out as “factual” when I know that they are not. 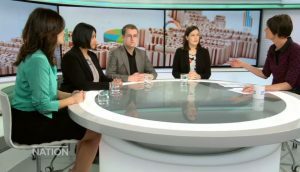 So yesterday I watched this television interview; “The would be MPs” where National’s Erica Stanford, Labour’s Priyanca Radhakrishnan, Jack McDonald from the Green Party and Brooke van Velden from Act discuss why they want to get into Parliament and the key issues for this election. Labour’s Priyanca Radhakrishnan either (1) doesn’t know how to work a calculator or (2) she is comfortable to use blatant untruths to argue a point. My Calculator – as a mortgage broker I have access to bank calculators which we use to assess affordability. Using the joint income of $160,000 quoted by Labour’s Priyanca Radhakrishnan and using more than one bank I can confirm that a couple can borrow about $1,100,000. As a mortgage broker I am speaking to first home buyers all of the time. I will source home loans for those which I can, and provide advice on how to structure their loans so they can be paid off more quickly. Incomes – often young people do not earn enough money to buy a home. If you are really dedicated to buying your first home and income is an issue then you could consider getting a 2nd job and taking in a boarder. Often an extra few dollars will make a big difference. Deposits – it’s difficult for young people to save a deposit large enough to buy their first home. The banks often will tell you that you need a 20% deposit but they can approve applications with 10% deposit at times and there is the Welcome Home Loans scheme which has just raised the housing cap so more first home buyers can use this. Also, don’t forget that you might be able to withdraw money from your KiwiSaver and apply for a HomeStart Grant too. Children – once you start a family the household living costs increase and this makes it harder financially. There is some support with Working for Families which helps a lot, but this is scaled to help those on lower incomes more. Other Debts – one of the biggest issues that we see that stops people from being able to afford a home loan is the other debts or financial commitments that they have. I understand that we like big televisions, nice cars and holidays but when you are trying to get into your first home some of these things need to wait. Most people that we see that want to buy a first home come to us and they have credit card debt, store cards, hire purchase and others. Regardless of what politicians say or promise it will always be hard to buy a first home. Don’t believe any politician that tells you they have a magical cure for what is being called “the housing crisis” as they don’t – FACT. If people want lower priced houses then there is one way to achieve this and it’s been proven elsewhere in the World. The ONLY way to lower house prices dramatically is to wreck the New Zealand economy, which would see immigration return to net outflows with Kiwi’s leaving again in droves to Australia and beyond, the job market in dire straights with massive unemployment and the banking system collapsing. Some would say that there are political parties in New Zealand that might be able to achieve this! Welcome to Detroit – once upon a time, the city of Detroit was a teeming metropolis of 1.8 million people and it had the highest per capita income in the United States. Now it is a rotting, decaying hellhole of about 700,000 people that the rest of the world makes jokes about. CLICK HERE to read more. Forget lies or blatant untruths – that’s how you get affordable housing!